By now, most specialty boards in medicine appear to have "heard" practicing doctors over their displeasure over the American Board of Medical Specialties' (ABMS) proprietary MOC® program. They understand. They agree with us. They want to play nice. Really. They know how much we really don't like that secure examination every ten years that makes sure about 10-15% of experienced physicians fail because, well, someone has to fail. They understand that the busywork created by the ABMS MOC® program is time-consuming, duplicitous, expensive and meaningless for assuring quality care. A few of them even acknowledged, by golly, that they got it wrong and promise to make things better by setting up new "design principles" for further MOC® development. But our ABMS Specialty Boards really don't seem to get the big problem: fraud. Instead, some keep asking doctors to cough up $2100 for "new and improved" exercises that excludes the old MOC® secure examination and replaces them with annual "mini-assessments." Fortunately, there's a small group of specialty societies that want change, but appear a bit too nervous about ridding themselves of the term "MOC®." They include the American Gastroenterological Association, the American Association of Clinical Endocrinologists, the American College of Rheumatology, and (maybe) the Heart Rhythm Society (although this statement is a greatly toned down version of an earlier one). But these Specialty Boards and professional organizations are relatively small fry compared to the much larger and richer specialty boards like the American College of Cardiology and the American College of Physicians who remain surprisingly quiet on the controversy. The American Board of Medical Specialties (ABMS) has a problem. A big problem. Their credibility bloom with practicing physicians is off the rose. Once an icon for assuring ethical, quality specialty medical education, the ABMS and their fellow member boards of the ACGME needed more. Much more. So they over-reached. They paid themselves handsomely despite the origins of the Specialty Boards being frugal. 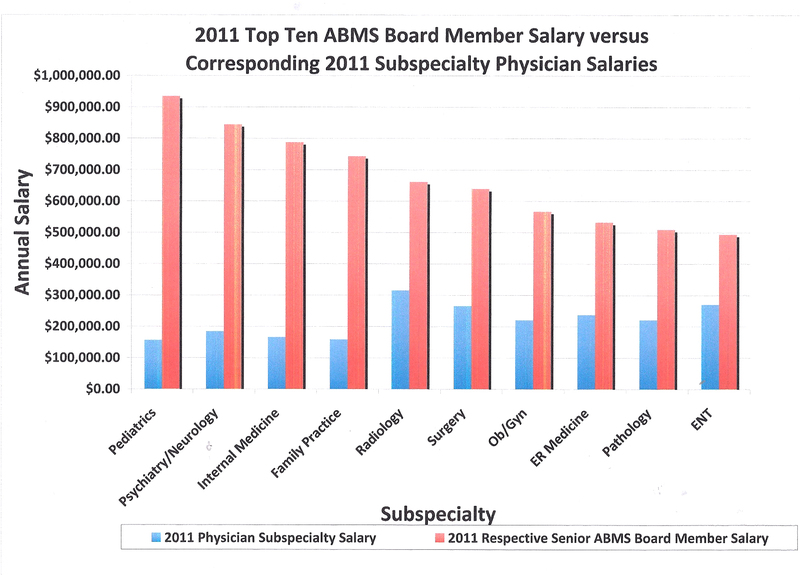 Almost without exception, the leadership of every ABMS specialty board has Presidents and CEOs that make far more income than their contemporary practicing colleagues - way more. They fly first class (or have until 2000), commonly have expensive dinners at the finest five-star hotels, some of which even overlook the Pacific Ocean, travel overseas to spread their regulatory gospel, all because they can. After all, they are special and they are unregulated. Meanwhile, residents and fellows making $50,000 a year are wondering where they'll come up with the $3000 or so it takes to become "certified" by the ABMS in their specialty. The result? Practicing doctors don't trust our ABMS specialty boards any longer. Worse still, the more recent transgressions have prompted a look back at history, and history has shown the ABMS non-clinical specialty board leadership stumping for corporate interests for personal gain instead of stumping for patients' best interests. Is this what the Boards call "professionalism?" The ABMS member boards also continue to allow their Presidents and CEOs to lead their organizations far past the usual maximum one-, two- or three-year term limits of the original boards, all while these executives earn lavish salaries and benefits as they appoint new "Chairs" and "Directors" to make each organization seem "fresh." The ABMS's largest member board also happens to be the American Board of Internal Medicine (ABIM). The ABIM still has the sizable problem of their ABIM Foundation that no one wants to mention: that "secret society" without a credible public mission other than "to support the ABIM" when it was created in 1989. The only logical reason for its creation was to accumulate money from the pockets of practicing physicians to fund an investment portfolio created by the now defunct 1838 Investment Advisors (which were paid handsomely each year to do so). The ABIM leadership did very well using practicing physicians' money for this purpose, accumulating a bankroll of over $59 million without concern of IRS intervention. They also lied about their government lobbying activity that likely helped cement the ABMS MOC® program in the Affordable Care Act. Then, in what can only be considered (at best) an incredible lapse of judgment, they bought their infamous luxury condominium (complete with chauffeur) with some of their colleagues' testing fees they "granted" to the Foundation. But it's hard to shelter that a profit motive for a non-profit from the IRS unless you have a plan, and who is smarter than the folks and lawyers at the ABIM? 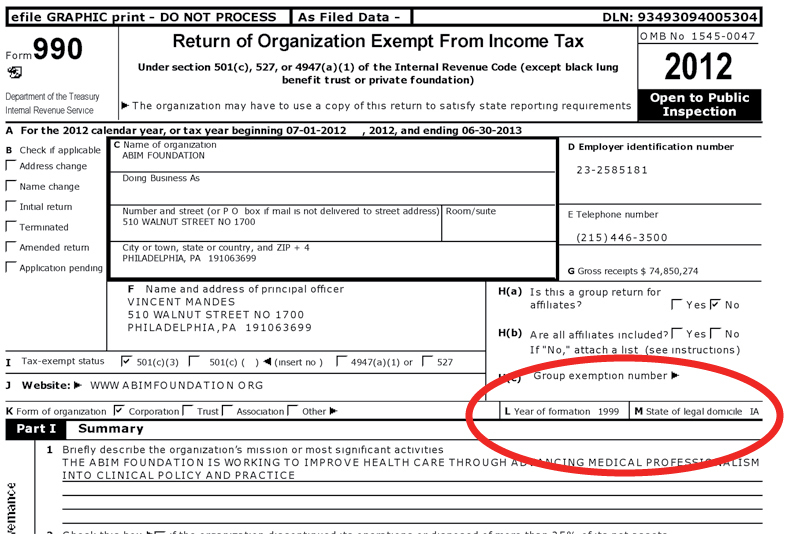 First, for Deception #1, you have to file a request for tax-exempt status for your newly-created "American Board of Internal Medicine Foundation" with the IRS. 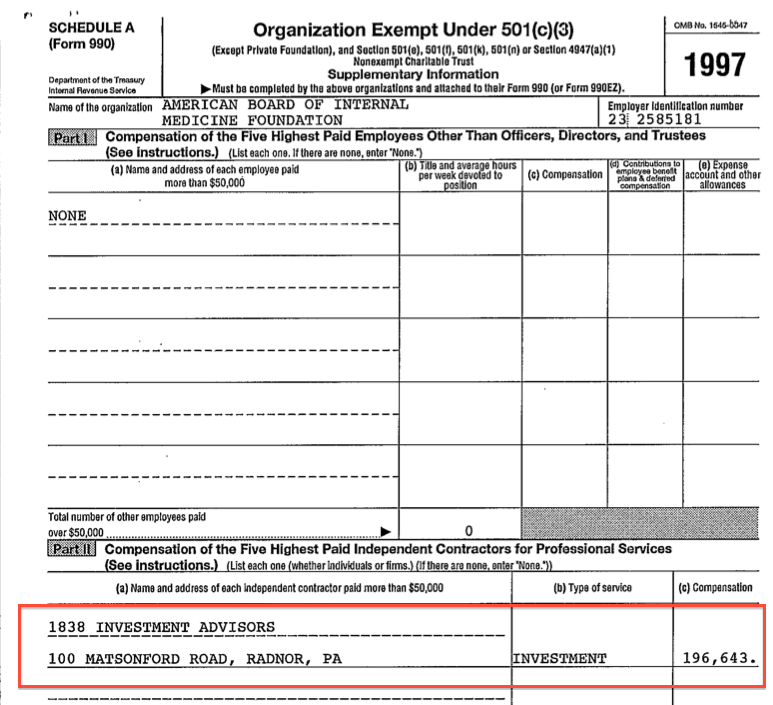 Note that this was a very different name from the "ABIM Foundation" that was filed with the state of Pennsylvania in 1989. That way, the "American Board of Internal Medicine Foundation" never had too many dollars in its coffers to be tracked by the Internal Revenue Service (IRS). Next, to avoid the tax consequences of accumulating a lot of money in a non-profit, you have to deflect. Unfortunately for the ABIM, changes in the IRS Form 990 made in 2008 required them to start reporting a "state of domicile." 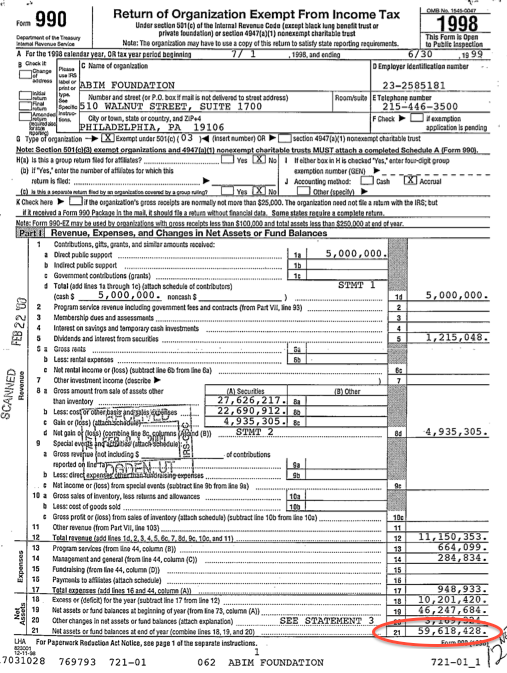 Deception #2: tell the IRS and the public (repeatedly until this year) on their Form 990 that the ABIM Foundation was domiciled in Iowa where no financial audit is required. Then, when you realize your Foundation (that's supposed to be supporting the ABIM) has made a lot of cash covertly from the wallets of ABIM diplomats and investments, you magically perform Deception #3: ask the IRS to change the name of your "American Board of Internal Medicine Foundation" to the "ABIM Foundation" yet keep it 'domiciled' in Iowa. 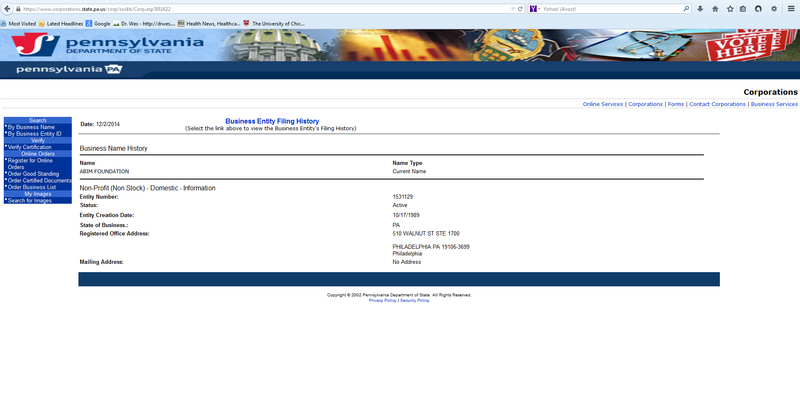 Oh, and be sure the "computer-generated notices" are "changed" and a new non-profit determination letter is re-issued in the new name because, gosh, they got it wrong when they first applied. And guess what happens? The new ABIM Foundation magically has a boat-load of physician-supplied cash to give back to the ABIM (or their many cash-hungry friends who promise to spread the gospel of "Choose Wisely®") without an easily traceable trail because (as the ABIM Foundation website and their tax forms claimed) the ABIM Foundation really didn't exist (in the public or the IRS's eyes) before 1999! Finally, it is very important to perform Deception #4: Make up a reason the ABIM Foundation was "created" in 1999 and delete the web page the stated the ABIM Foundation was "restructured" in 1999 as an operating Foundation to 'complement' the ABIM." Then be sure the reason for the "new" Foundation sounds really sincere - like "to advance the core values of medical professionalism to promote excellence in health care." 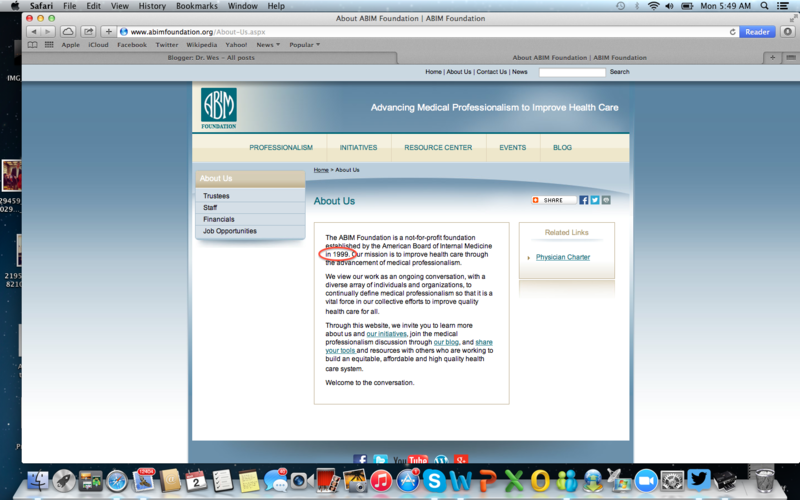 (Forget to mention you created your own definition of "medical professionalism") Who could argue with such a "mission?" Also, make sure to create a Physician Charter of all your best bureaucratic and academic friends so they can join you at really nice venues to talk about things. Then make sure doctors "Choose Wisely®" treatments that they must forego in the name of "social justice." Once you've done all of these things, no one will ever know (or have time to suspect) where all that ABIM Foundation money came from. It's a clever way to hide the money trail to the ABIM, it's officers and membership fees paid by the ABIM to the ABMS, don't you think? Now, let's end the ABMS MOC® program entirely - every last bit of it - shall we? That would be the truly professional thing to do and every ABMS specialty board today knows it. It's complicated, but it's not. Yet it is. Or maybe Lynn Langdon will one day apologize to Sarah Von Muller. My prediction : docs will do nothing ,, albeit concerned physicians on this Blog ! They did nothing during obamacare " debate " ; nothing on anti vaccine debacles ( until some effort post Disneyland measles event ); nothing about the lack of primary care docs and their poor pay ! Me : huge supporter of wonderful , brave men & women healthcare professions. Occupy Boards to help " make " change ! But the docs --- too busy or to complacent or need of more leaders for this needed reclamation of medicine !! You have the power ( studies still list physicians as the most respected amongst their patients ) --- Use the Bully Pulpit ! Organize ! Use the blogs , social media , press, --- use " kitchen table " examples to explain to the citizenry why it is important to pay attention to the new industrialization trends of medicine ,,,,,,, make sure PA's and RNP's are used ( bad word, I know) correctly in the management team !! Just my $ .02 worth !! Thanks Wes --- we need more from your ' listeners ' - they need to spread the word & organize !!!! The more I know, the more angry I get. Dr Baron, your silence is repulsive. Eichenwald says more news on the ABIM/MOC is coming. Wants questions posted in the comments section of his video channel. Link below. No live Q&A. What can be done to take these crooks to justice? Seriously. ABIM reminds me a lot of Pablo Escobar's organization during the 1980's in Colombia. Similar techniques, different victims. Extortion, intimidation, collusion, tax evasion, money laundry. Hope you guys are taking your precautions. Messing up with mafia dudes is risky business. CFO S. after 30 years "retires"; F. replaces him. Files 2004 late in 2005. New investment "strategy" with index funds. More sheep needed to fill ABIM's "BPB". Tax Aware Investment Strategies: Optics of Investing Smart and Fast. Discrimination and the ABIM. A History that Needs to be Examined. According to Pennsylvania court records the ABIM has an employment history of discriminatory practice against blacks, women and other employees of color. Have you examined this at all by looking at the court records to see for yourself. These were settled out of court to keep it from the media. ABIM has also violated the disabilities act, by denying a paper test to at least one physician with visual impairment. They have a policy which will not accommodate many with some disability or another. Is this discrimination to be tolerated. This is also a great deception to appear ethical and yet be immoral and abusive toward employees and clients. Will anyone address these issues of discrimination during Cassel and Baron's tenure. Lynn Langdon was involved as well in the employee abuse according to documents. Pacer is an online source for court proceedings and settlements out of court. create a free account and type in ABIM to access the many lawsuits against them and the violation of civil liberties against physicians with ABIM vs. Arora. Read the federal court list of items to seize so that physicians could be incriminated and bullied. Is this the kind of organization worth talking with or about endlessly? They need to be reported to federal, local and state authorities and pursued for fraud and negligence in court. Try PLOS medicine to publish. What is the argument against giving the same exam to everyone all the time, by specialty, whether for first certification or later? Follow the money. Why ask people the same question(s) over and over every few years other than to extract fees from the test-takers? How much of that repeated information goes out of date? Who checks those "questions?" And can you keep those questions "secure?" What measures would be needed to do so? Has it ever been shown to improve patient care quality? In today's internet era, is such testing really needed for the "public good" or for the financial bottom line and largess of the organizations that monopolize this antiquated educational assessment process? Answer those questions, then re-read this post. Like so many things in history that started with good intentions, ABMS certification now stands for little more than greed, politics, and money to support the ever-growing medical education bureaucracy rather than the doctors and patients on the front line of health care.